Notes: Small lay-by sufficient for two or three cars directly by gate leading to the castle. The castle isn’t sign-posted (but the settlement of the same name is). A cliff top castle (heavily ruined). The exterior can be viewed but you can get no closer than the photos as the castle has been fenced off due to structural instability. Nevertheless the scenery is impressive and can be well appreciated from the surrounding ground. A cairn has been erected for the MacArthurs. Castle has no access due to structural instability. 1. The original name for the site, Dun Dhaibhidh, translates to 'David's Fort'. 2. Around the time the castle was abandoned, a local story records that a nursemaid accidentally dropped the baby of Sir Alexander Macdonald out of a window. The child was killed on the rocks below the castle and in revenge the maid was set adrift at sea. 3. 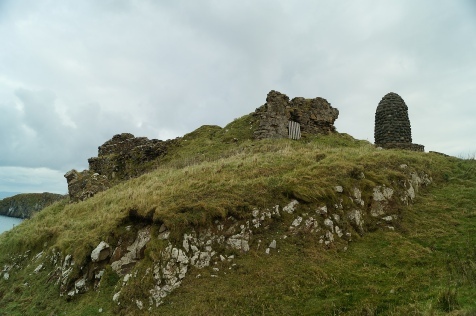 It was in the dungeon of Duntulm Castle that Hugh MacDonald, cousin to the Clan Chief and a rival leader of Clan MacDonald of the Isles, was starved to death. His captors tormented him giving him just salted beef and no water driving him to insanity prior to being overcome by dehydration and starvation. One report suggests he attempted to eat his own hand before dying. Perched high on the cliffs of Totterish, Duntulm Castle was hotly contested between the Macleod and Macdonald Clans. Centuries of warfare and feuding were ended by a settlement in favour of the latter but in 1730 the castle was abandoned for a more comfortable residence elsewhere. Situated on Trotternish, the northernmost peninsula of the Isle of Skye, Duntulm was first fortified in the Iron Age. Its dramatic location, protected on three sides by steep cliffs, made it ideal as a promontory fort. Called Dun Dhaibhidh it was later re-used by Nordic raiders as they consolidated their influence around the Western Isles and down the Western Scottish mainland. The site was probably still occupied when the castle was built in either the late fourteenth or early fifteenth centuries. The castle itself was originally a four storey Tower House with a courtyard enclosed by a curtain wall. Probably constructed by the Macleod clan, it quickly became embroiled in the clan warfare that plagued Scotland. The Earls of Ross and the Lord of the Isles (Clan Douglas) vied for control of the area and at Duntulm this translated into friction between Clans Macleod and Macdonald. The former were the custodians in 1540 when James V visited but by the early seventeenth century it was held by Macdonalds. The dispute was eventually settled in 1618 with a charter granting it to the Macdonalds provided they made Duntulm their main residence. This prompted further additions to the structure; a new tower was added and the original one enhanced. Duntulm Castle was abandoned in the 1730s in favour of nearby Monkstadt House which Sir Alexander MacDonald had built as a new residence. He recycled stone from the castle in this building project leaving it a ruin. Its exposed location soon meant the weather took a hand and today the castle is unstable; the new tower collapsed into the sea as recently as 1990.